Originally published March 10, 2014. 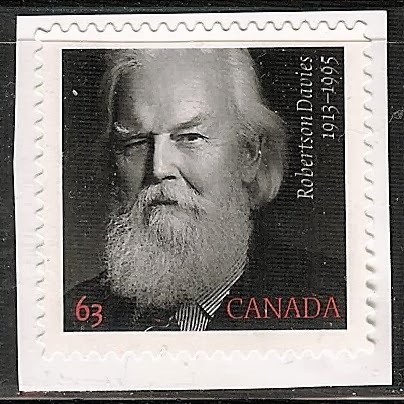 On August 28, 2013, Canada Post issued a stamp to commemorate the celebrated Canadian author Robertson Davies. Davies was also a playwright, journalist, critic and professor. Davies was born on August 28, 1913, in Thamesville Ontario. His father was a newspaper man and both his father and mother were avid readers. Davies attended Upper Canada College (UCC) when he was 13 and after graduating from UCC in 1932 he attended Queens University in Kingston, Ontario as a special student not working towards a degree. He left Queens for Balliol College in Oxford, England and received his Bachelor of Literature in 1938. After graduation, Davies began an acting career and did literary work for the Old Vic Repertory Company. During this period Davies also met his future wife and married her. In 1940 he returned to Canada and became the literary editor of the magazine Saturday Night. In 1942 he became editor of the Peterborough Examiner a position which he held until 1955 (He was the publisher from 1955-1965). 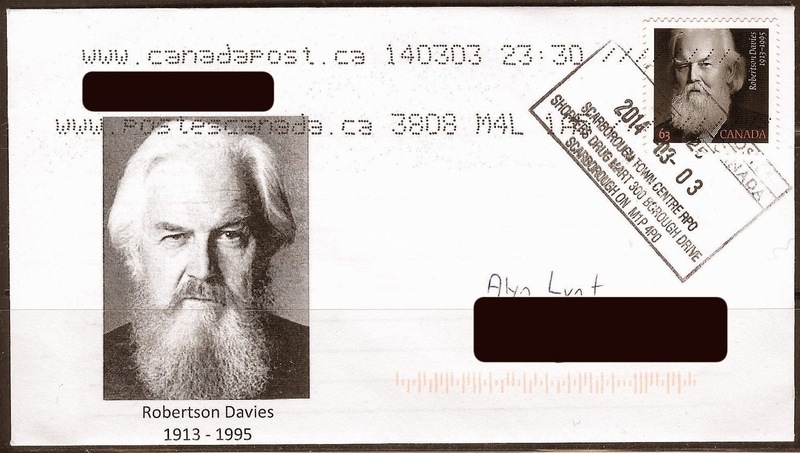 During his time at the Examiner, Davies wrote a number of plays, humorous essays and fiction novels. He was also a key player in the establishment of the Stratford Shakespearean Festival. In 1960 he became a professor at Trinity College, University of Toronto (U of T) teaching literature until 1981. While at U of T, he became the Master of Massey College the U of T’s new graduate college. After his retirement, Davies continued to write and lecture up until his death on December 5th, 1995. A listing of all his works can be found on Wikipedia. І am extremely impressed with your writіng skillѕ as well as with the layout on yⲟur blog. see а nice blog like this one today.